A groundbreaking Australian study on effective childbirth education was recently released by Dr. Kate Levett and Dr. Hannah Dahlen (who were also key-note speakers at our annual conference). This study highlighted how important it was to not only participate in independent childbirth education classes, but to also find a program that included complementary therapies to support normal labour and birth. It basically halved the intervention rates for births! We are very proud to say that the Hypnobirthing Australia program ticks ALL the boxes when it comes to providing an effective, evidence based childbirth education course which also incorporates all of the complementary studies highlighted in the study. CLICK HERE for the results of the study. We are leading the way in Australia with updated information regularly being added and modified for Australian healthcare systems. 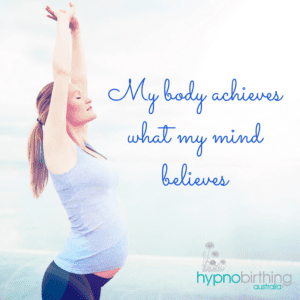 So let’s take a look at the key areas highlighted in the study and how the Hypnobirthing Australia program covers all of these key areas plus more! As our name suggests we incorporate hypnosis techniques to provide relaxation, keeping in mind that with self-hypnosis you are actually in a heightened state of awareness. You do not disassociate from your body, in fact you become more aware of your body, and all of your senses become acute and sensitive – you can hear clearer (so that is why we ask people not to have conversations around you because they can be distracting). Strong smells like essential oils or perfumes can be distracting and make a mum feel too high or nauseas. Your skin becomes highly sensitive to touch and may respond really well to massage for relaxation and to release endorphins (your pain relieving hormones). Through self-hypnosis you learn techniques to release fear, tension and pain. We focus on fear release techniques, because at the end of the day if a woman is experiencing fear, then she is releasing her “fight or flight” hormones, creating tension in the body, which ultimately creates more pain…..and this enhances that Fear-Tension-Pain cycle. With self-hypnosis you can feel your baby moving down and you surrender to all these sensations rather than fearing them and you let go of control and go with your instincts, your breath and your body. You “zone in” rather than “zoning out” which is a common misconception about hypnobirthing by other programs and health care providers. This is one of the most important components in our program, as without the proper breathing techniques you are not getting enough oxygen to the all important uterine muscles or your baby and creating tension in the body. Our breathing is divided into 3 separate breathing techniques – relaxation breathing, surge breathing and breathing/bearing down – and the way to practice your breathing/bearing down at home gives you that “aha moment” where you understand and feel the opening of the sphincters. Acupressure can be used for relaxation, labour, birth and the postpartum period. We also emphasise that although acupressure is very good for helping a mother to feel calm and relaxed – it can’t make you go into labour unless your body is ready and this is very important for couples to recognise. It provides a labour focus, which means it can increase whatever is already going on in the body, rather than giving couples a false expectation that using acupressure can induce labour. The birth mother and partner are given access to additional information about using acupressure techniques to promote relaxation, pain relief and balance in the body and to help facilitate stronger surges during labour. Visualisation is used through pregnancy, birth and afterwards. Some of our visualisations are literal (like the muscles of our uterus working or imagining ourselves in a beautiful place in nature) and some are more abstract. We also include a fun project whereby couples create their positive affirmation posters/vision boards for birth. We know that imagery is so powerful for that mind / body connection and we demonstrate this through activities during the classes so you will feel and understand how the mind controls the body like a robot. We focus on light touch massage because this is beneficial to help women become relaxed and calm and release endorphins. The skin is the largest organ of our body (remember that from Year 9 Science?) – and so we have the ability to release copious amounts of endorphins (natures own pain relief) through gentle, loving touch. These are demonstrated through the active labour and birthing positions we provide, along with relaxation positions, movement, stretching and safety during movement. Some of our practitioners are yoga instructors or body workers, or those that are not have a relationship with local yoga studios, pilates instructors or pregnancy physios to refer clients to for ongoing support in safe body movement and positions, so that they can maintain their practice after the classes have finished. We also discuss the “Optimal Foetal Position” of baby and the active positions to use to encourage baby into the best position possible and how to use rebozo techniques if baby is not in an ideal position such as posterior, where labour may be prolonged or create more pressure through the back. We don’t believe that having a posterior baby means this will be a “bad or negative experience” for the mother. We’ve had many mums birth their babies “sunny side up” and so this is just another way of birthing your baby – it is about finding the position that best works and is the most comfortable for you. Our birth partner is involved in classes and practice because the partner has a significant role in supporting their labouring woman in a positive way. If the birth partner is feeling stressed or anxious then that energy is going to be transferred to the birthing mother – and that is the last thing she needs during labour. The birth partners go away with an easy reference “cheat sheet” that they can use on the day to remind them what they have learned in classes. Our classes provide the birthing mother and partner with enough knowledge, confidence and power to positively approach their birth. We focus on empowering parents so that they can make informed choices for their birth and be positive and calm no matter how their baby is born. 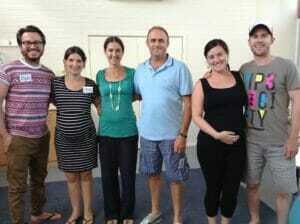 Now let’s also look at some of the other important information that the Hypnobirthing Australia course includes. We break this down for you in a really simple and easy terms and highlight what your hormones are doing and the effects this will have on your body and why. We share what signs to look for, how to know when to go to the hospital or call the midwife, and also include medical procedures such as vaginal exams, what happens when you arrive at hospital and red flags where you need to contact your medical team urgently such as early release of membranes, bleeding, swelling, spotted or blurry vision or unusual pain. We give you an overview of the different medical induction procedures, their effectiveness, the risks and benefits and an explanation of the cascade of interventions. We also provide you with some common natural induction methods but are very cautious in encouraging women to try and bring on labour before baby is ready and the reasons why. 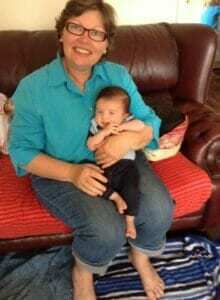 Hypnobirthing Australia is not focussed on “natural birth at all cost”. Our program does not set women up with unrealistic expectations – because we know that all women are unique! We cannot all be cut from the same cloth so we can’t all expect to have a natural, pain free birth, although many who participate in our program actually do and our “birth stories” written by the parents are testament to that. However, special circumstances do arise, and the Hypnobirthing Australia program is about being able to ask all the right questions and making choices based on your own set of circumstances. We also have positive birth stories from couples who have had medical inductions, epidurals and caesareans who have used their hypnobirthing skills to remain positive and calm. So much more is included such as nutrition during pregnancy, delayed cord clamping, your choices in the birth of your placenta, skin to skin contact, bonding, breastfeeding and the immediate postpartum period. Our program is all about having a positive, calm birth no matter how your baby is born and being prepared, educated and confident. and the Hypnobirthing Australia program ticks ALL the boxes! We have classes all over Australia – CLICK HERE TO FIND YOUR CLOSEST CLASSES. All the best to you, and happy hypnobirthing! This article was written by Vicki Hobbs, an experienced Hypnobirthing Australia Pr actitioner who teaches regular classes in the Northern suburbs of Perth, WA. Click here for further details about Vicki’s classes.